Why is there a stray dog population? In the Ceausescu era, (the ex-Romanian Communist Party leader who became President of Romania in 1974, ruling until 1989), people’s land and homes were taken away to pay off Romania’s debts, apartment buildings being built for them to live in instead. Anyone that owned dogs and cats had to turn them loose on the streets, they were not allowed to take them in the apartments. Most were not neutered and people were left powerless as the animals starting breeding on the streets. Years on, and the dogs started running in packs and scaring people (most were harmless). So most people over the years started fearing and hating the dogs. This may explain why still today we see such violent cases of extreme abuse to dogs. The mayor of the country’s capital Bucharest stated that the quickest way of getting rid of the strays was mass slaughter, and soon enough other cities followed in suit. For over 20 years the dogs were chased, captured and killed in numerous cruel and painful ways. They have been shot, poisoned, hung, burnt to death or crammed into small kennels to die of hunger and thirst – as they still are today. The situation for dogs worsened once again in a horrific manner in the autumn of 2013, when stray dogs were accused of killing a boy in Bucharest (even though it has subsequently been discovered that this was not the case). The Romanian president and the press stirred up the hatred towards the animals, and succeeded in pushing through a Law allowing the killing of all dogs after 14 days of their capture, unless the local mayor has the funds to allow the dogs a longer stay at the public shelter. Despite protests across Europe, petitions, appeals and demonstrations, the Law was accepted anyway. Romania took a huge step back in time. The streets became a frenzy of dogcatchers, and the images from Romania of abuse emerging was so sickening that Paws2Rescue was born to help the dogs. Today, dogs are still killed using sickening cruel methods, and the Law encourages the mass catching and killings of dogs at public shelters. The President was supported in his campaign by uneducated people, who blindly believed his promises of cleaning the streets through the killings. Stray dogs started to become a big money earner for the government and dog catchers, paid to cleanse the streets. It is a globally known fact is that the stray dog problem cannot be solved by killing dogs, but only with neutering and by the education of the nation. Yet the slaughter goes on in Romania, against all these facts. Public shelters are overflowing with dogs, dying in inhumane conditions of starvation, disease, being eaten by other dogs, mistreated and abused by the workers and then killed painfully using inhumane methods. 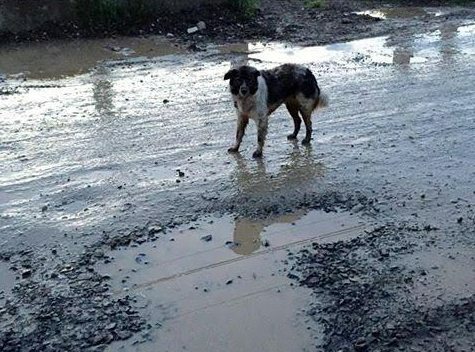 Today, life as a stray in Romania is truly hell on earth – and the land remains stained red with the blood of the continual murder of innocent puppies and dogs.